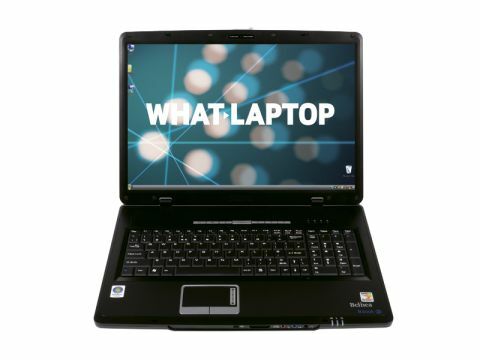 The Belinea b.book 3 is an affordable but low-powered, desktop replacement laptop designed with business use in mind. The 3.3kg chassis is large among its peers. It's best used around the home or ofﬁce, as proved by its low 161-minute battery life. The overall build quality is average, and matches the entry-level price tag. The 17-inch screen provides ample space for working across multiple applications. Although colour and contrast are limited, the matt TFT screen ensures reﬂections are minimal, improving visibility in bright conditions and direct sunlight. The large keyboard is comfortable to use and includes a full numeric keypad. It has a smooth typing action, but some keys on the right-hand side have been reduced in size, which leads to frequent miss-strikes. Despite the use of 3072MB of memory, the dual-core AMD processor fails to deliver anything more than basic performance. As such, this is a laptop best used for word processing and browsing the internet. Storage space is equally basic, but covers the essentials. The 160GB hard drive will suit family use, but is bettered by many rivals. The dual-format DVD rewriter and 4-in-1 media card reader let you back up and share ﬁles. The b.book's warranty is a key selling point. Three-years of parts and labour cover are provided, with one year of collect and return service. You'll need to pay all related delivery fees in the second and third years, however. The affordable price, large screen and comprehensive warranty make the Belinea b.book 3 worth considering for basic home and ofﬁce use. Its low performance is disappointing, however, and better options are available.